Pine nuts have long made up a part of the American diet; they were staple foods in many Native American cultures. They were eaten as far back as 10,000 years ago, according to Michelle Hansen at the University of Oregon. At 191 calories per ounce, pine nuts pack a fairly hefty caloric punch. However, they still make worthwhile additions to your diet because they are an excellent source of vitamins and minerals. Pine nuts provide generous amounts of the essential vitamins E and K. Both of these nutrients have an effect on your cardiovascular system -- vitamin K allows you to form clots to prevent bleeding after injury, while vitamin E helps you produce red blood cells essential for oxygen transport. Each ounce of pine nuts contains 2.7 milligrams of vitamin E, or 18 percent of your recommended daily intake, established by the Institute of Medicine. Pine nuts also provide 15 micrograms of vitamin K per ounce -- 12 percent of the recommended daily intake for men and 17 percent for women. Incorporate pine nuts into your diet to reap the benefits of their manganese and zinc content. Manganese helps maintain your body's hormone balance and connective tissue strength, while zinc supports your immune system and aids in wound healing. Each ounce of pine nuts provides 2.5 milligrams of manganese -- your entire daily recommended intake -- and also contains 16 percent of the recommended daily zinc intake for men and 23 percent for women, as determined by the Institute of Medicine. 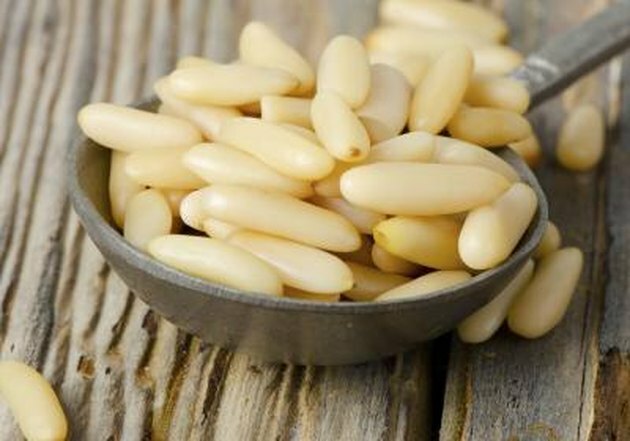 Pine nuts' iron and magnesium contents also offer health benefits. Iron plays a key role in helping your body transport and store oxygen, and it also helps your cells produce useable energy. Magnesium also contributes to energy production, and it makes up a part of your teeth and bones. Consuming an ounce of pine nuts boosts your iron and magnesium intakes by 1.6 and 71 milligrams, respectively. For women, this amounts to 9 percent of the daily iron and 22 percent of the daily magnesium intake, recommended by the Institute of Medicine. For men, each ounce of pine nuts also provides 20 and 17 percent of the recommended daily intakes of iron and magnesium, respectively. Use pine nuts to prepare homemade pesto. Simply blend the nuts with parmesan and fresh basil in a food processor, and then mix in extra virgin olive oil until the mixture reaches the desired consistency. Lightly toast pine nuts to increase their flavor, and add a handful of nuts to your favorite salad, soup or wrap. Alternatively, consume pine nuts on their own as a snack. Try mixing them with healthful seasonings, such as paprika or cayenne pepper, to add extra flavor.